Please find here some notes about the first day of class and reminders for things to do by next class, Sept. 8. We talked about the course and the course topics and showed our interest for each topic by “voting” for our own top 3 on the white board. I’m saving the image here so we can go back to it if needed later in the semester. We introduced ourselves and found that we have a very diverse group of students from all around campus. Neat! Finally, we talked about the initial motivation for the course – that of understanding the aspects of society that have been deeply changed by social media. 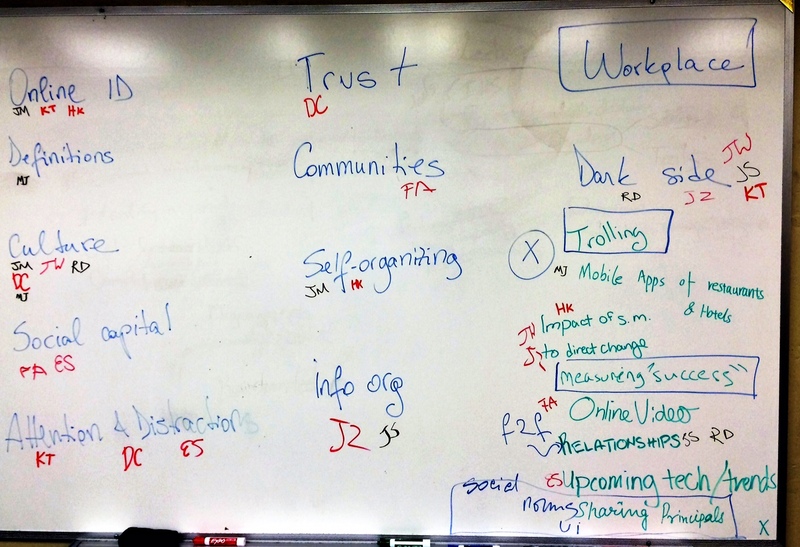 The course topics are selected to illustrate this theme. Read the articles posted on Blackboard and fill out the reading notes. Fill out the worksheet with your own personal online identity management plan. Set up your blog on wordpress.com. Learn how the blog works, learn the difference between post, page, tag and category. Create the categories mentioned in the syllabus so you can easily categorize your posts later on. Set up your twitter account. Remember what we discussed about (a)nonymity. Make an informed choice. Go to the wiki page on Blackboard and paste the links to your blog and twitter account. Set up your RSS feed reader (e.g. Feedly) and subscribe to this blog and to all class members’ blogs. Follow me (@mihaela_v) and all class members on Twitter. I’m just a student; what should I tweet about? Questions about any of this? Please ask in the comments below. Now that your Twitter accounts and your blogs are set up, it’s time to spell out expectations for using them. Some of you have used Twitter and blogs before, some of you haven’t. While that might impact how comfortable you are with the technology, in some ways, for this class, you may be starting afresh. In CGT581, I hope you will use Twitter and your blog to learn about using social media for productivity, to document your learning & reading, and to connect with people you can learn from. 1. Use Twitter & blogs to connect with people you can learn from. I’ve helped you identify some people who work and write about enterprise 2.0, and recommended you subscribe to their blogs, read them regularly, and follow them on Twitter. Connect with these people by commenting on their blogs, blogging about what they wrote, and engaging with them on Twitter. Extend your Twitter network to include these professional contacts, in addition to the people you are already following. 2. Learn and document your learning. Use your blog to reflect on what you’ve learned from someone else’s blog post and to link to the original post. Use Twitter to disseminate links to blog posts relevant to class (whether your own or someone else’s). Use Twitter and commenting to discuss class-related issues with your classmates. Show me and each other what you’re reading and learning online, and help each other discover interesting resources. For example, if you discover a blog or a Twitter user we should all follow, write a post about it. Explain what the blog is about, or what the person does, and make a brief argument why we should follow them. Provide all necessary links. Blog – between 16-20 blog posts, spread out evenly throughout the semester. The blog posts may contain your original ideas, but they should be in response to something you read online – whether a professional blog post or a mass media article. Your post should include links to relevant resources. Remember, we’re not using blogs in this class for navel gazing. We’re using them to point to interesting resources, comment on them, help others find them. Your posts need not be lengthy. Anywhere between 250-400 words is fine. Twitter – I’ll look for two things: posting relevant links and engaging professionally with people both inside, but especially outside, of class. So, your funny banter or comments about the football game won’t count (though you’re welcome to engage in them – they do help you build & maintain relationships), but comments about using social media in the workplace/for productivity and posting relevant links will count. I will also look at your list of people you follow, and make sure you are following professionals in the social media space. If you believe your current Twitter account is not suitable for networking professionally, feel free to create a new one, and let me know (I don’t think this is the case, but it’s entirely up to you). 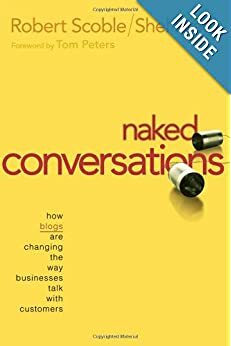 Blog comments – I will need to see the comments you have posted on other (professional, not personal/entertainment) blogs about social media & productivity. You can use Backtype to collect your comments (be careful, make sure you give all the info it needs to pick up your comments & you let me know your username so I can follow you) or you can start a new page on your blog where you link to the comments you’ve posted. You can follow these instructions, posted by a fellow teacher. Ask me in class about how to write meaningful comments on blog posts. Remember, social media engagement is a large portion of your course grade, so you need to take it seriously and invest the time it requires. I don’t expect you to know how to do all this – so please ask me questions. I need to make sure you’ve read and understood these instructions, so please post a comment or ask a question in the comments below. P.S. – thank you again, Kyle, for the nice image in the blog header!